A couple of the electro caps look to be the wrong way round to me but this is definitely as per the scheme and it was by Dirk and so a trusted source. The EarthQuaker Devices Crimson Drive is an all-analog, dynamic overdrive that uses a germanium transistor and vintage germanium diodes to create an abundant, open sounding tone that simply isn’t available through FET or Opamp driven effects. The Crimson Drive works beautifully with both humbucker and single coil pickups to get the most out of your amplifier by pushing your preamp tubes into natural overdrive with a choice bit of distorted input boost. The Gain knob gives you control over a broad sweep of harmonically rich effects from a well-textured treble boost to an abundance of viscerally satisfying plexi grit. The low pass Tone control dials back the high end while the Level control keeps the damage to a reasonable level. The Crimson Drive responds to your playing and cleans up with your guitar’s volume control. It is Made in the USA, wired for true bypass, and operates on a standard 9vDC power supply or a battery. great choice once again. i was just watching this video on youtube. you guys reading my mind? I've changed it since I first posted because I noticed a mistake and then my OCD kicked in and something else was annoying me :) So anyone who got the first post will want to get the latest now which corrected a couple of misplaced resistors. Those backwards electros are freaking me out! Any recommendations for gain on the AC128? I do have a couple of then sitting around. Can't wait to try this one out. Is the layout a different version than the video? I don't see the tone control as in the video or description. I agree, No tone pot? Yes this is an earlier version, if I see an updated scheme I'll add it, but for now this is all we have. Ah ok, cool. I didn't realise there was a different version. What about replacing the 68K Res with a pot, so you got a low pass or not? I'm not sure, but maybe it is the same tonecontrol like in the Pedal shown in the video? i'm going to build this one but also add the SWTC to it to tame the top end. What a great sounding pedal. Definitely on my list now. I have some AC128's with hfe ranging from 55 to 100. I tried a few trannies with hfe from 30 to 120. IMO the best range is 60-80.
will definitely stick-in those values first. I just finished building and testing mine (3 knob version with the tone control). it sounds awesome. I have a bunch of AC128's and my favorite is with an hfe of 90 measured on my peak atlas DCA55. You socketed the output cap, which value are you running ? I socketed the tone cap. tried it first with a 22n but it wasn't quite enough so I went with a 100n. i made 2 from John's layout. Seems like both of the Tone is not working. Any suggestions ? Your vero layouts are very nice looking. Which software do you use? diy layout creator. I forget which version though. nice work John. I think i'll try your layout this weekend. I want to use your layout with the tone control added. Thanks for posting. The polarity of the1uf that goes from input to gain 3 on your layout is reversed from the site layout. Is it better that way or does the orientation not matter? oops. yeah, that 1u is backwards on mine (error) but I don't think that it matters at all since mine works and sounds great with it mounted that way. I just flipped it around on my build and it sounds the same so i'll update my layout just so it'll match. That's one of the caps that I expected to be the opposite orientation, with the negative to input which to me is still the right way to do it. The other one is the 100u cap at the transistor emitter. I can't fathom that one at all. Just finished this one up. Sounds good. It does clean up really nicely with the guitar volume control, but also gets pretty thick and fuzzy with the volume all the way up and the gain all the way up. Doesn't seem trebly at all to me though, more on the bassy side I found. Probably just my right though. i didn't show volume 1 connected to the board since i always ground that lug to the jack. i like as few wires possible coming from the the board itself so you need to ground lug 1 to any wavailable ground. the right way around too! My AC128 has a gain of about 100. A bit less would probably be better. Great as always John. What do you stick between the pots back side and the circuit's bottom to prevent short circuits? Is it paper or something? I just hot glue the board to the back of the pots. How did you add the tone control? Might be a stupid question, but should the AC128 be PNP or NPN? I'd think NPN for the layout is negative ground... Am I right...? No. AC128 is definitely PNP. PNP or NPN doesn't dictate the use of positive/negative ground. Check the Fuzz Factory for example. That has normal +9V and negative ground with two PNP germanium transistors. The electron flow is determined on the design rather than by transistor. One can always use the transistors in "wrong" (or not intended) way. Thanks. Would 1n34 work instead of 1n60p for the Ge diodes? You'll get slightly different character with different diodes. I would personally go with 1N4148 here if i didn't have 1N60Ps. Going to have to respectfully disagree with you here, Miro, because although the 1N34A is a slightly different diode than the 1N60P both are germanium diodes, so the change in character will be less pronounced than if you swapped in 4148s (silicon). If you like the original character of the pedal but don't have the 60s, go for the 34s first. I do it all the time (I don't even own any 60s). Granted, replacing those with Si is just my opinion. Reason i personally would always opt for Si instead of Ge is that Germs just sound bad in every single design (Oct Up Sick Box, MXR Dist+, OD250, ZVex Machine, etc.). Only one benefitting from Ge diodes is the Centaur. So i would definitely go with Si here. Then again - 1N60 and 1N60P are both Schottkys. So swapping them for 1N4001 would be a lot closer to the character than with a lot leakier 1N34As or 1N270s. I have to agree with Miro, 34a's will get you no nearer the original pedal than 4148's. In my opinion neither will give you the glassy tones of a 60p, 4148's are more articulate and dynamic where 34a's are more wooly and have more of a volume drop. Why not try both on a Dpdt switch? If originality is a priority I'd suggest buying some 1n60p's. Well alright, I guess you guys know more than I do. Using the 34As has always worked for me but... now I'll have to agree with dexxyy and say try some out and see what you like (which isn't a bad idea with most diode clipping circuits anyway. Cheers for that Dexxyy. Second every word. I had exactly the same experience when i built my first OD250 circuit. Ge diodes may be mojo for someone, but to me they sound just bad in most circuits. And 1N60Ps are great sounding clippers. Glassy and harsher than many others, in a good way..
Wow... Thanks for your opinions, I dind't think this simple question would start such a long converstaion about clipping diodes :) In my Sonic Distortion build I used two spst switches for different diode clipping options, but I've found myself using either LED + Ge (some OAxxx, I don't know - the ones I could get in my local shop) or 2xSi + Ge. I really like the GE-only clipping too, but then the volume drop is too heavy. So to me Ge plus assymetrical clipping seems to be the mojo - at least in that pedal. I'll give the 1n34s a try here and see how they perform. My idea is anyway to use some of my old russian MP40 transistors in this build. I don't think they will work too good, as they are really low hfe, but I'll see. I can buy an AC128 anytime and usually I socket the trannies and the diodes anyway. Do you happen to have the schematics for this one? I googled a bit, but there is not much about this pedal available... Actually only this blog about the insides ;) Thanks! Built John's version with the tone control yesterday. Very nice, but I get considerably less gain than on the video. Tried with an AC128 (hfe=90) and an AC125 (hfe=106). Both are quite high leakage (around 400uA), but that's what I have... Of course the hfe values are calculated with taking the leakage into consideration, so those are the "real" gain values. Solder bridges, solder points and component values are all checked and seem to be ok. The volume is ok, gain is more or less ok too, but goes only up to a nice overdrive level, not that beefy, saturated sound that can be heard on the videos. The one 100uF capacitor going from the emitter to the +9V seems to be weird to me though, I'll try swapping that the other way around. Also this overdrive gave me an idea what to do with my low hfe and low leakage russian trannies. I tried to use an SHO in place of the JFET buffer. So far it sounds quite nice, more like a fuzz in higher gain settings. I'll experiment a bit more with other boosters in the front too. If you are interested I'm happy to share my results with you. what's the drain voltage on your J201? hey john, what do you connect to tone lug 3 of your layout? hmmmm, my tone knob is acting as a volume control. what did i do wrong!?! it's sounding good, but it needs tone for sure. or if anyone wants to chime in here. i'm sure it's just me being a rookie. Are you suer the tone does not change? Mine gets a little louder and gainier when I turn the tone up, but I think that's normal. The tone is just a low-pass filter here, and I think the effect is quite trebly by nature. So when you turn the tone down you actually attenuate the more pronounced high frequency range and therefore make the whole effect quieter. yeah if i dial it down, the volume just goes away. I'd check the tone control's capacitor. If that is wrong, then your tone pot will actually work as another volume pot. That is the 100nF cap from Tone2 to ground in John's layout. Has anyone experimented with a diode lift with this one? I NEED the Hoof layout. 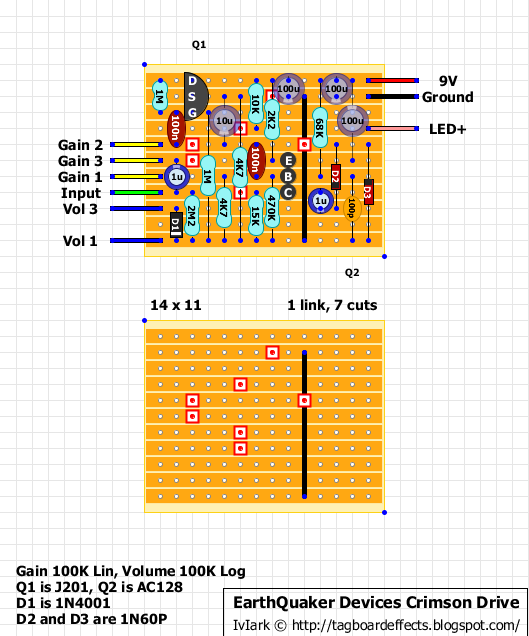 I have a rough schematic from a buddy of mine, but I've never had to make a layout myself before. Help? awesome work john, as usual, youre the man! on your crimson drive is that another example of your ptouch labeller? how are you getting those fonts if so? also, i found your layout for the hoof fuzz, do you have any recommendations for gain ranges on the germaniums in it? what about gain for the crimson drive? Has anyone tried to build the Hoof Fuzz linked above? I am getting no sound at all. I am a little insure how to properly install the LEDs. Does the black circles represent the cathode? just make sure that the tow pairs have the cathodes and anodes opposing each other. I built mine off of that vero so I know that it works. I finally figured it out! This pedal sounds AWESOME!! The one I built is really quiet. The biggest surprise is how much the guitar volume knob affects the pedals tone and grit. I have been messing around with transistors and Clipping LEDs for the Hoof Fuzz and have found a combination I REALLY like. I am currently using 4 of Ge transistors listed in the layout. The 4 Ge's really make it sound really 'creamy'. Also, I have some super bright 5mm orange LEDs in the second clipping stage (super bright red 3mm in the first). I am very new to this stuff so my question is: Is there anything wrong with the above changes. Could the wrong transistor create problems down the road? Is this the ver. 1 or ver. 2? Version 1 used PNP germs while ver. 2 uses NPN germs. Can anyone elaborate on that? Version 2 uses a a J201 and a PNP Ac128 germanium. Sweet. This is good news. Much obliged. Hi everyone. I've discovered recently this site, thank you all for all the layouts and advice posted ! I've build the 3 pots version, works very well except a background noise, doesn't make the pedal unusable, but it is quite annoying. I've tried to use battery, to change the AC128 (I had 2 or 3 available) no noticable difference... Does anyone has the same problem ? Any idea ? 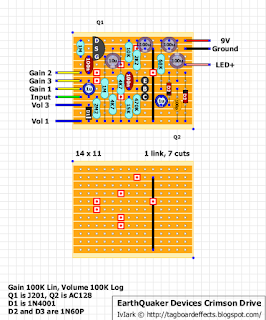 intend to try this layout soon, but is there anywhere i schematic i can use for reference? anyone got one? thanks. If the cap is electrolytic it matters, if it's poly or ceramic it doesn't. In the layout above they are electrolytic so it matters. If you look at the layout the 1uF cap has one side with a white line on it, to represent the negative lead of the cap. If you look at an electrolytic cap there is one side that has a line on it from top to bottom, some are white, could be grey or orange or yellow, it depends on the manufacturer. You want to make sure the line on the cap is match up to the line of the cap as it appears on the layout. How can i make this louder? im running mine with the volume dimed and its barely as loud as the bypass.is there a resistor i can change the value of to get more volume? I'm sure I'm a bit fuzzy, but where is the output? Is it taken from volume 2? correct. even though it's not marked in the layout notes, but if you look at the volume pot, lug 3 is going to ground, lug 1 is the connection to the circuit, and there's no output marked on the layout, so lug 2 has to be the output. Finished this one yesterday (Thanks Mark!). It seems to work fine, but there's a constant static sound. Not a buzz or hum, but static. Any thoughts? I have the similar static noise going on. Any suggestions to make it less noisy? Okwilliam- had the same problem then used 100 ohm resistor from the power rail and the sound decreased. Does it work with 2n5457 as replacement for j201? hey, I just build this. I was expecting an overdrive but it's more like a fuzz (a strange fuzz, almost octave-ish). Any ideas on that? Unable to find any AC128s or Ge substitutes, I tried a bunch of silicone PNP transistors and got very good results with a BC558. Not bad at all. Hey, I'm a newb at this and i'm having some trouble with this one. I've already made an EP Booster circuit work, and this one is my second failed project (the other before this one being a Amber OD with the same result). I couldn't find the J201 near where I live (I'm from Brazil), so i tried breadboarding it with a MPF102 and a K246 but it didn't work. All i get is a "bee" sound through it, and the guitar does not come out. Does anyone have any ideas of what i can try? Compre j201's do Ebay ou da Tiggercomp eletrônica (ficam bem mais caros). Ah, and of course, make sure there aren't any other problems with your build. This layout is supposed to be based on Dirk Schematic but in the schematic there are 4 diodes ( 2x1N60P, 1x1N4001, 1x!n4148) , the layout is missing one 1N4148. I have built the schematic in a breadboard ( got it to work) , when I have tried to build it with the layout and stripboard not success ( it can be many reasons, still working on it) but debugging I found about the diodes difference.